From Middle English crabbe, from Old English crabba (“crab; crayfish; cancer”), from Proto-Germanic *krabbô (compare Dutch krab, Low German Krabb, Swedish krabba), from *krabbōną 'to creep, crawl' (compare Dutch krabben), from Proto-Indo-European *grobʰ- (“scratch, claw at”), a variant of *gerebʰ-. More at carve. Further cognates with frequentative-infix are Saterland Frisian krabbelje (“to creep, crawl”), Dutch krabbelen (“to scratch”) and German krabbeln (“to crawl”). A crustacean of the infraorder Brachyura, having five pairs of legs, the foremost of which are in the form of claws, and a carapace. (in plural crabs, informal) An infestation of pubic lice (Pthirus pubis). Although crabs themselves are an easily treated inconvenience, the patient and his partner(s) clearly run major STD risks. (rowing) A position in rowing where the oar is pushed under the rigger by the force of the water. A defect in an outwardly normal object that may render it inconvenient and troublesome to use. -- "I suppose you wouldn't like to do a locum for a month on the South coast? Three guineas a week with board and lodging." -- "I wouldn't mind," said Philip. -- "It's at Farnley, in Dorsetshire. Doctor South. You'd have to go down at once; his assistant has developed mumps. I believe it's a very pleasant place." There was something in the secretary's manner that puzzled Philip. It was a little doubtful. -- "What's the crab in it?" he asked. Arrested by the low price of another “desirable residence”, I asked “What's the crab?” The agent assured me that there was no crab. I fell in love with this house at sight. Happily, I discovered that it was reputed to be haunted. (transitive, US, slang) To ruin. 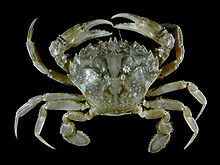 (intransitive) To drift or move sideways or to leeward (by analogy with the movement of a crab). Mutt stalked forward, matching him, step for step, crabbing sideways the way wolves do when they're going for the kill. The aircraft crabbed sideways in the cross-winds and leveled to horizontal. Another shouted order and again the squares crabbed sideways. (transitive) To navigate (an aircraft, e.g. a glider) sideways against an air current in order to maintain a straight-line course. (obsolete, World War I), to fly slightly off the straight-line course towards an enemy aircraft, as the machine guns on early aircraft did not allow firing through the propeller disk. “Nothing can possibly go wrong.” “Just as you say, sir. But I still have that feeling.” The blood of the Woosters is hot, and I was about to tell him in set terms what I thought of his bally feeling, when I suddenly spotted what it was that was making him crab the act. From Middle English crabbe (“wild apple”), of Germanic origin, plausibly from North Germanic, cognate with Swedish dialect scrabba. A cudgel made of the wood of the crab tree; a crabstick. A movable winch or windlass with powerful gearing, used with derricks, etc. A form of windlass, or geared capstan, for hauling ships into dock, etc. A machine used in ropewalks to stretch the yarn. A claw for anchoring a portable machine. To be ill-tempered; to complain or find fault. Funk & Wagnalls Standard Dictionary of the English Language. International Edition. combined with Britannica World Language Dictionary. Chicago-London etc., Encyclopaedia Britannica, inc., 1965. Inherited from Old English crabba. Of Germanic origin, plausibly from North Germanic.